Your thank you letter (or thank you email message) lets the employer know that you appreciate being considered for the job. It also reiterates your interest in the position and can be used to provide additional information on your qualifications. Learn why and when to send a thank you note and get tips on what to include in your note with examples. In part, sending a thank you note is simply a traditional post-interview courtesy. It shows the employer you are polite and professional. It is also a way to remind the employer who you are, as he or she begins to make hiring decisions. But more importantly, a thank you note is your chance to restate why you are ideal for the position. Think of this as your final pitch for why you should be hired. A thank you note is also an opportunity to clear up any moments in the interview that didn't go perfectly. You can clarify an answer to a question that you feel you botched in person, or you can add more details about relevant experience or abilities that weren't mentioned during the conversation. Immediately after the interview, jot down some notes and impressions. Think about the questions that were asked, and which skills and responsibilities seemed most important to the interviewer. These impressions are easily forgotten, so get them down on paper quickly. Use these details to help personalize your thank you note. Send your note soon after the interview; ideally, you will email (or mail) a thank you note the same day as the interview, or on the following day. You can email a thank you note within 24 hours of the interview. This is a great, quick way to share your thanks. Most employers are fine with an emailed thank you note. However, some surveys suggest that some hiring managers like typed notes sent via snail mail. Others like handwritten thank notes. So, consider the "personality" of the organization and the rapport you felt during your interviews. If your interview was a fairly informal process and/or you achieved an immediate rapport with your interviewer, a handwritten note might be an option. If the interview was more formal, consider a typed (either mailed or emailed) note. Keep your audience in mind. Like any piece of writing, it is best to keep your audience in mind. Address the interviewer’s issues and concerns. If there was any question brought up by the interviewer about your qualifications, address it here. On the other hand, if you bonded with the interviewer over a specific topic, you can mention it in your note as well, as a way to remind him or her of who you are. Think of the note as a sales pitch. You may also view your thank you letter as a follow-up "sales" letter. In other words, you can restate why you want the job, what your qualifications are, how you might make significant contributions, and so on. This thank you letter is also the perfect opportunity to discuss anything of importance that your interviewer neglected to ask or that you neglected to answer as thoroughly, or as well, as you would have liked. Keep it brief. 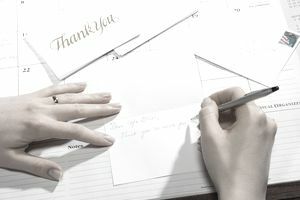 While you can include both a thank you and a “sales pitch” in your thank you letter, you still want to keep it short. This is not another cover letter, but instead a concise way to remind the employer why you’re the right choice for the job. Say no with a note. Even if you do not want the job, write a thank you letter respectfully withdrawing your application. You want to be polite because you never know what the future holds – why burn your bridges? Consider sending an influence letter. In certain circumstances, you may want to send a more detailed influence letter, which includes additional information on your skills and qualifications for the job. Here's when to write an influence letter, plus what to include, and samples. Proofread thoroughly. Check your spelling and grammar before sending your letter. If in doubt about the correct names, spellings, or titles of your interviewers, call the office to double-check. Your efforts will be worth it! This is a sample interview thank you letter. Download the letter template (compatible with Google Docs and Word Online) or see below for more examples. It was a pleasure to meet with you regarding the marketing manager position with your firm. After hearing about the new direction you are planning to take with your marketing division, especially the plans to incorporate more interactive media, I am even more confident that I would be very interested in joining your group. My background includes strong experience in social media and web development, and I have some great ideas already to help with the rebranding. Thank you for taking the time to meet with me. I’ll be in touch later this week to follow up with you, but please don’t hesitate to contact me at your convenience with any additional questions. I look forward to speaking with you soon. When you're sending an email thank you note, list your name and "thank you" in the subject, and include your contact information in your signature. What if you spent an entire day being interviewed (and/or taken to lunch) with several people? Are individual thank you notes appropriate or should you write a group thank you letter? Choose your approach based on what you think will be most in keeping with the "personality" of the organization. Also, consider whether the interviews had very much in common with one another. If there was a great deal of similarity (i.e., shared concerns voiced by your interviewers), perhaps a "group" letter will suffice. However, it never hurts to take the extra time and send an individual thank you letter to everyone you met with. When dining and interviewing be sure to thank everyone you spend time with, both for the meal and for taking the time to discuss the position and the company with you.